This electrical hunting themed cover plate has a hand painted poly resin layout with wonderful detail. The perfect décor enhancement with a design to suit just about any outdoor enthusiast\'s taste. 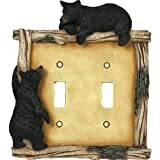 Black bear double switch plate cover. Polyresin. Fits a standard double switch. 6" high x 5.25" wide x 3/4" deep.